Please join me for 2 dynamic wine classes this Spring as I explore new wine trends and facets of wine appreciation. The wine classes will be held at Hamilton’s Grill Room in Lambertville, NJ from 7-9pm. June 20, 2016. Top wine producers were on display touting the unique terroir in New Jersey. 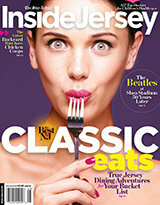 NJ.com feature article on The Educated Grape….“Businesses partner together to educate and entertain. Visit http://www.nj.com/hunterdon-county-democrat/index.ssf/2015/04/al_warr_businesses_partner_together_to_educate_and.html to read the article. In the Summer edition of Inside Jersey, I was asked to select a case of wine for a summer beach house for $150. Click here for the details of the story. George Staikos and The Educated Grape were featured in the September issue of Hunterdon Life Magazine.